What a pity that the media feeding frenzy before the November revival of the World Requiem built up expectations that were never going to be met. It is important that works from the long tail are performed and recorded. 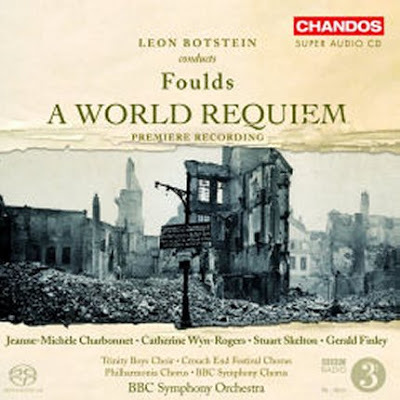 Give me the World Requiem, with all its flaws, rather than yet another recording of Mahler 5. Botstein? Geez, he's everywhere! I think if I open my wallet Botstein will jump out shouting "Gavril Popov!!" I'll wait to buy the Foulds when it shows up in the used bins, as it surely will. Thanks for the update, Pliable. I agree. I want to hear both new music and music new to me. I'm half envious; Botstein is doing much of the stuf I've always wanted to! And he's doing it well. Does anybody know who the soloist will be in the Takemitsu? I had contemplated spending that weekend in NYC already for the Bang on a Can Marathon, and I think I could peel away for a few hours for that.